But inside is a calm oasis, the first thing you see is a large stone waterfall rippling along the entire wall in the entry. Then you pass a couple of trees with Yellow Pa Taut blooming, which is a Burmese flower that blooms during the Burmese New Year in April. The menu offers a taste of Rangoon, Mandalay, Maymyo and Meiktila all which are in the central and southern areas of Myanmar (formerly known as Burma). In 1989 they passed a law that officially changed the English version of their country’s name to Myanmar, so I wonder if this should be called Myanmari Food? Well, since I am unclear, I’ll continue to call it Burmese. 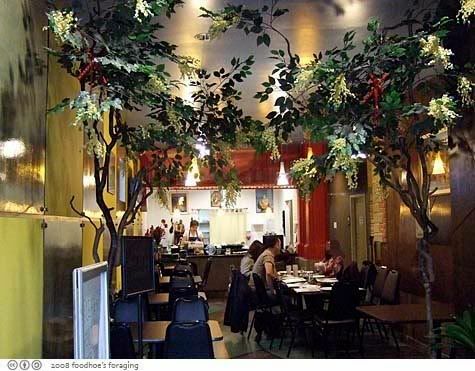 The cuisine is influenced by the flavors and spices of its neighbors, India, China, Laos, and Thailand. 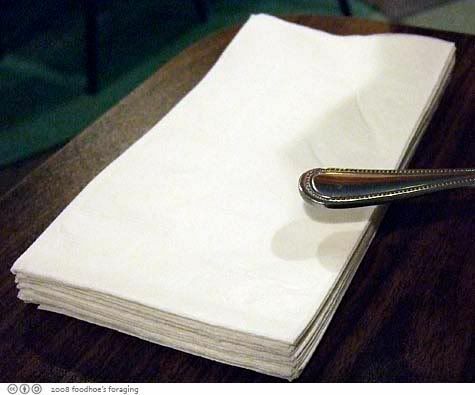 The owner and chef Kam Fong Eng was very helpful in placing our orders and keeping the food flowing for our table of 10, I was very impressed that she left us an extra pile of napkins, which is something I always have to ask for. 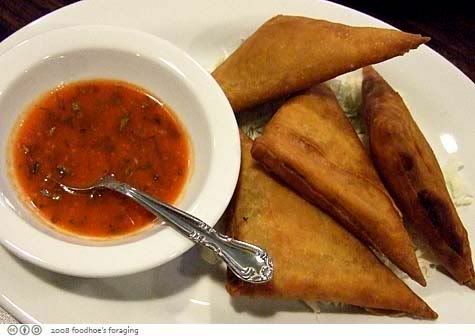 Samosas (4 pieces) $5.95. 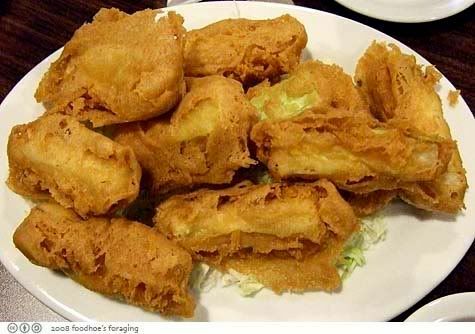 Fried golden triangle shapes filled with curry potato served with special sauce. The wrappers are sheer and delicate and shatter with a satisfying crunch when you bite into it. Normally I’m suspicious of special sauce, but this was something entirely different. It was spicy with chilies, garlic and some fragrant herbs and ignited anything it touched. Fried Opo By Thee Kyaw ($6.50) served with another special sauce that was darker in color and didn’t include any fresh chunks of garlic or herbs. This seasonal vegetable is also known as the bottle gourd or calabash. The owner Kam said it is a squash that looks sort of like zucchini but is sweeter and reminds me of chayote. 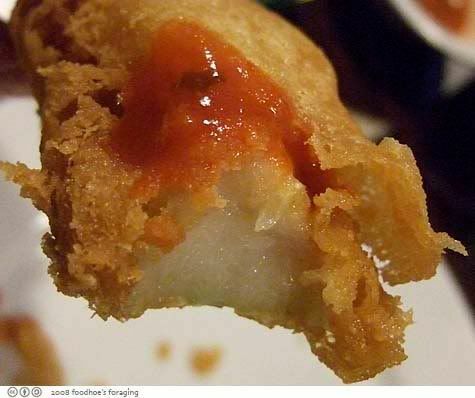 It has a dense, starchy texture that is well suited to being dipped in batter and deep fried. 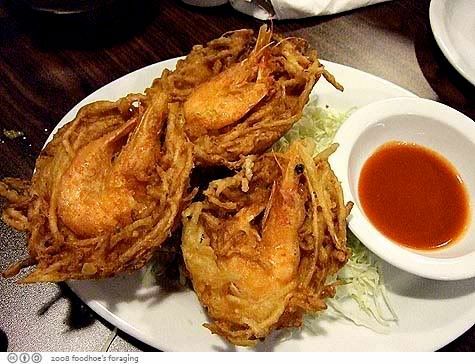 The last of our three appetizers was Pa Zune Kuat Kyaw ($5.50) Whole shrimp (with heads and shells) on top of a pile of bean sprouts that is battered and fried and served with the same delicious spicy sauce as the Opo squash. They looked like weird insects slumbering in a nest and the shells added an intense crunchy texture. In retrospect, we should have tried at least one non-fried appetizers, no? Garlic Noodle with Sliced Pork Se Gyet Khauk Se’ ($8.95) is the one Burmese dish I am familiar with. 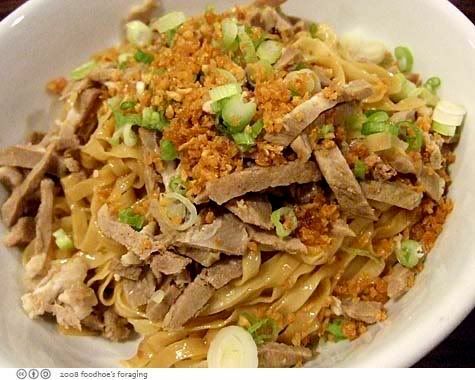 The flat noodles are tossed in a pungent garlic oil, then topped with sliced pork, green onion and fried garlic. 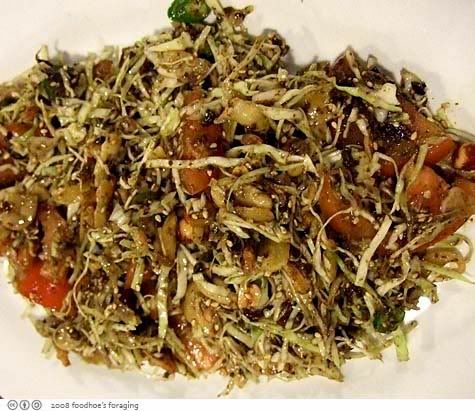 The noodles were supple and elastic – perfectly cooked and the combination of ingredients was light and refreshing. She dropped off a small bowl of clear chicken broth with thin slices of green onion and minced garlic that I latched onto. 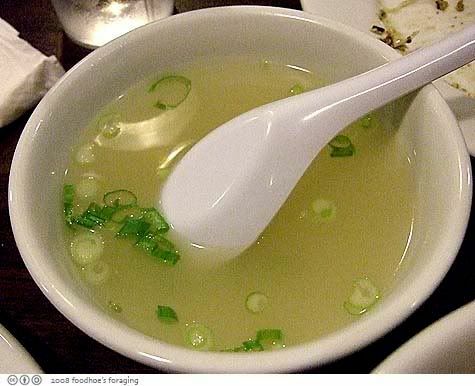 It was a really good bowl of chicken soup with clean fresh flavors. Curry Beef with Aloo Amae Tha Aloo Se Pyan ($10.95) The meat was slow cooked with Indian spices until it became meltingly tender. 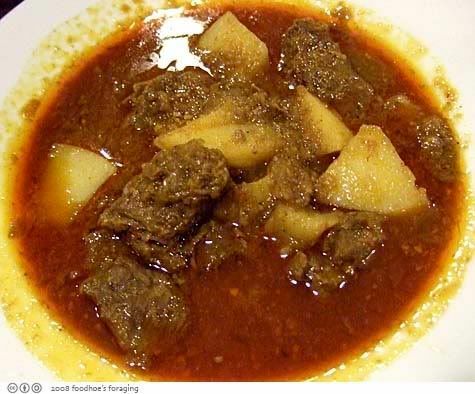 Both the meat and the potatoes absorbed the rich and complex flavors of the curry. Burmese Curry Pork Belly with Bamboo Shoot Wet Tha Myint Se Pyan ($9.95) was my favorite dish of the evening, one that I can’t stop thinking about. It wasn’t particularly spicy, but was bright and fragrant and full of fatty and obscenely delectable pork belly. 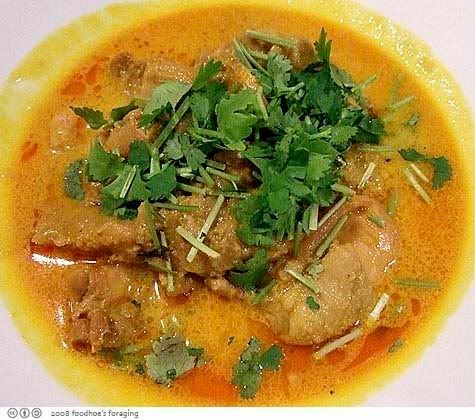 I read that Burmese curries, like Thai curries, are herb based, rather than spice based and typically are made from garlic, ginger, chili, turmeric and dry shrimp paste. 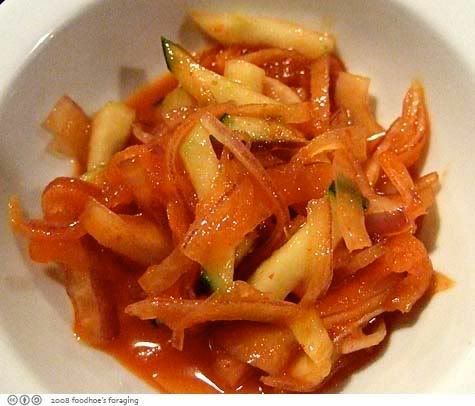 The tender, slow-cooked pork belly meat fell apart when prodded with your fork and the soft gooey globules of fat glistened, runny with the spicy sauce. It literally melted in my mouth, leaving me craving more, lots more… I complimented Kam effusively and she smiled and said that you have to treat yourself sometimes. Falooda ($6.25) Ice cream, jello and tapioca with rose syrup. 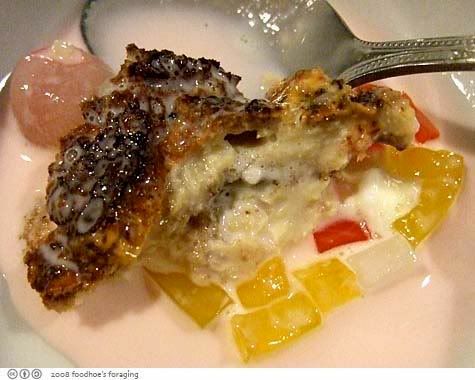 Apparently this is famous in Myanmar a combination of ice-cream, egg pudding, milk etc in sweet syrup. 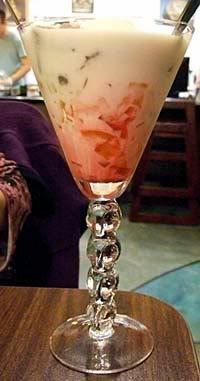 It is believed to be an adaptation of a Persian beverage that is named for the strands of cornflour vermicelli that float in it. 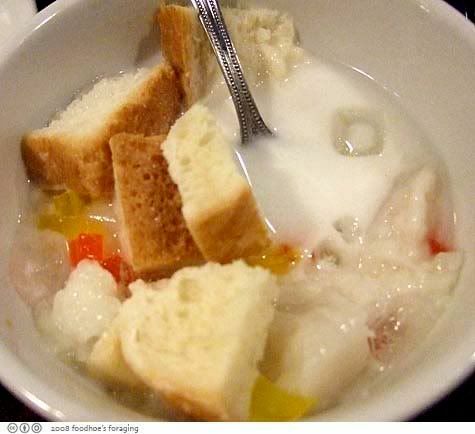 The Burmese version has agar-agar jelly, flavoured with rose and coloured green or red. It reminded me of strawberry milk with some jello bits and was not very popular at the table. Also floating inside were chunks of an egg custard that had a distinctly burnt appearance and a dry spongy chewy texture. I might have liked it better if it had been a creamy custard-y texture but I found this dish to be puzzling, overall I’d say it was a dud. Oh, my, gaawd, Foodhoe. I think you outdid yourself in the fried eating! That sure was a lot of fried things. That fountain drink looks so refreshing. 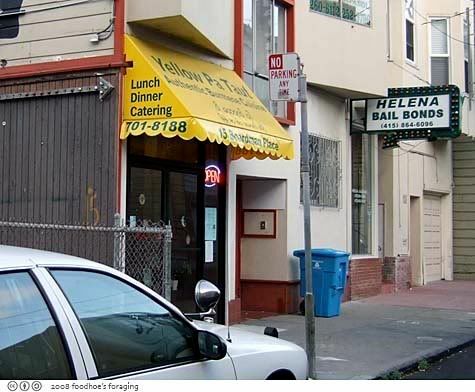 Who knew there were restaurants across the Hall of Justice other than Bail Bondsmen. An interesting place! Such restaurants are rare here… Nice food! Very nice pictures. What kind of camera are you using? Midnight Snack, thanks for visiting and for the compliment! I just use a little point and click Fuji Finepix F20. It’s a great little camera and does excellent in low light situations w/o the flash. 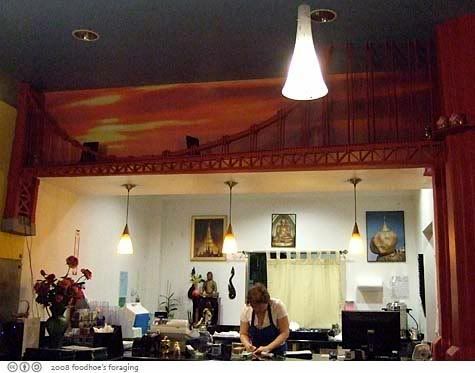 the decor looks lovely, but the food looks out of this world! I was scrolling down looking at the photos going, yum until I hit that pork belly and it stopped me with a ‘WHOA’!! This place definitely goes on my try list. I hope that Kasma taught you some tips that can translate over to Burmese food too. What a feast! You have been hitting up quite a few of those Southeast Asian places lately! Mrs. L, yes WHOA !! try that pork belly! 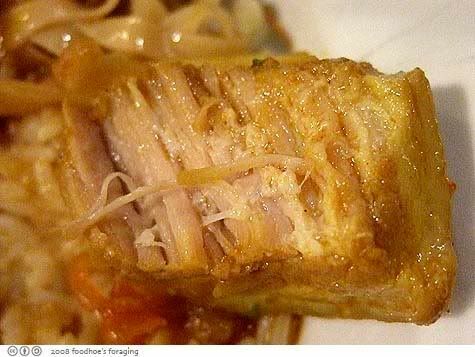 PE, that would be a good thing, I was trying to find a recipe for that crazy pork belly and burmese curry in general lol. SE food is the best! Great find, Foodhoe. Many of America’s culinary treasures are located in the hood. 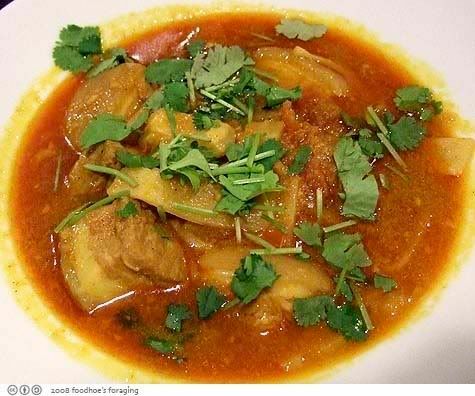 The Burmese Curry Pork Belly with Bamboo Shoot did look great. Anyway…doesn’t really matter, ’cause when I saw the opo squash I immediately remembered the ones that my grandma grew in her garden. They are delicious! very nice! the tea leaf salad looks sooo inviting and the coconut curry chicken does look flavorful – look at all that cilantro! 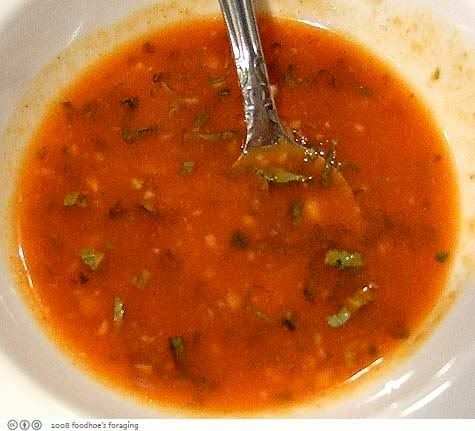 just love cilantro…..they seem to combine many layers of texture, spicy, hot + cold….looks like another great find.